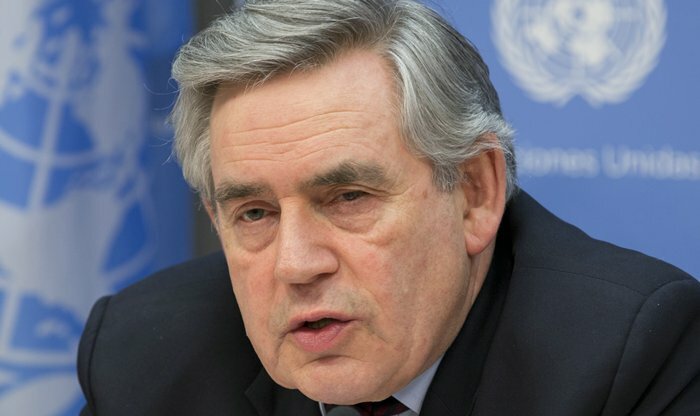 UNITED NATIONS — During a press conference given by Gordon Brown, the United Nations Special Envoy for Education and the former Prime Minister of the United Kingdom, expressed his deep dissatisfaction with the apathetic response of the international community toward funding the education of children in areas of heavy conflict. According to Brown education is currently down to 1% of all humanitarian aid. The focus of the press conference was on the $163 million gap necessary to expand a double shift school system implemented in Lebanon that would get an additional five hundred thousand Syrian refugee children enrolled into primary school. This would expand the current program nearly five fold. Lebanon introduced a two shift school system to not only increase education efforts, but also to address the need for assimilating the various non-formal programs which have been established in an attempt to address the need to educate the refugee population which has included an estimated seven hundred and fifty thousand school children, effectively doubling the population of school aged children in Lebanon. The informal programs range from Syrian teachers setting up shop in refugee camps to private schools, none of which transfer the students into the formal Lebanese school system. The Lebanese Ministry of Education began widespread outreach efforts in 2014 which have brought the number of enrolled refugee students in primary schools to an 104,000. Mette Nordstrand, Chief of Education in Lebanon for UNICEF, supported his claim pointing to the 835 schools that are currently available to add a second shift saying, “there [is] space for scaling up.” While that may be the case, if the average of 400 refugee students is applied to the potential spaces in existing schools, Browns estimation of a half million seats may fall short by 166,000 students. Brown took care to acknowledge the offenses that keep 28 million children out of school in Lebanon and other areas of conflict such as Iraq and Syria including child marriage, human trafficking, and child labor which he described as “[slavery] in many respects.” When asked about the attendance of Syrian children enrolled in the Lebanese split shift program, Nordstrand reported that there is no such data currently being collected. In fact, the only data that UNICEF was able to provide Europa Newswire was the number of children enrolled in the program and the number of participating schools. Nordstrand recognized that this is a big problem especially for education planners. Brown emphasized the importance for the international community to not become complacent and to increase efforts to ensure that all children have the basic right to an education, where along with their parents, they can feel safe from atrocities such as abduction and terrorism. To support this effort he called for international partners to reach an agreement on the proposed Global Humanitarian Fund for Education in Emergencies by the July deadline, announce a 1,000 school Pilot program (based on the success of a Nigerian program) where schools will be equipped with the tools necessary to utilize a terrorism forecasting application called PredictifyMe, and asked countries to give schools the same protections as Red Cross hospitals by signing the international Safe School Declaration.